585 p., 15,6 x 20,9 cm. In the Spanish-speaking world, Krausismo has had a strong impact which can be traced back to the works of Karl Christian Friedrich Krause (1781–1832). Krause applied the philosophy of freedom of German idealism in a practical manner and in doing so formulated postulates which at the time of their writing (1825–1828) were much too modern to be able to gain wide acceptance but which are receiving increasing attention today: intergenerational justice, nature conservation, subsidiarity and federalism, world law cosmopolitanism etc. Dierksmeier‘s work paints a historical picture of how Krause created his own metaphysics of freedom by breaking away from Fichte and Schelling, his former teachers. 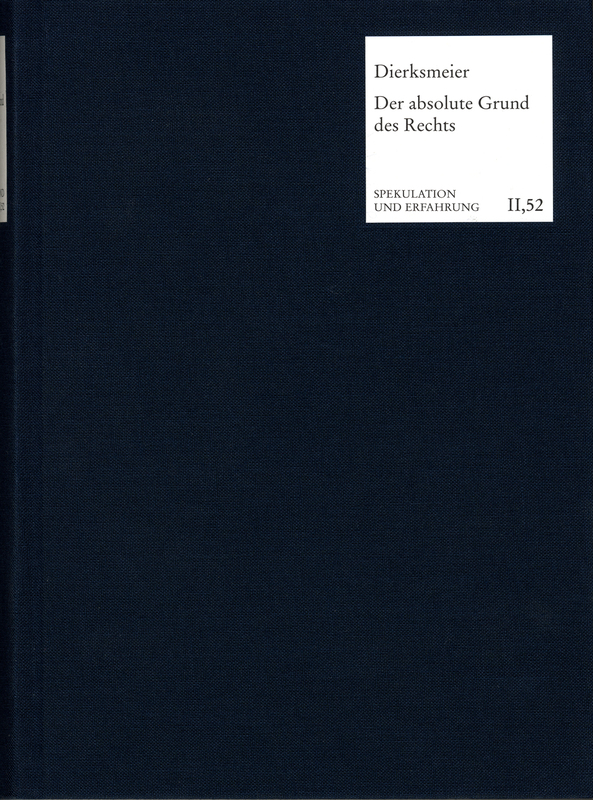 The study integrates the wide range of research done internationally on Krause and presents the first argumentative reconstruction of Krause’s philosophy in the world. Dank Dierksmeier liegt nun auch eine durch ihre Kompaktheit imponierende Darstellung über die Ansichten eines in dem hiesigen Land weitgehend unbekannten Idealismus-Vertreters vor. [...] Dierksmeiers Werk liefert [...] den fundierten Zugang zu den Gedanken eines Mannes, der schon vor 200 Jahren eine Gründungsverfassung für einen europäischen Bund zur Friedens- und Rechtsverwahrung skizzierte - und das ist wahrlich ein aktuelles Thema, dem eine Stelle im Rampenlicht gebührt.